CO-4: Distinguish among different measurement scales, choose the appropriate descriptive and inferential statistical methods based on these distinctions, and interpret the results. LO 4.30: Interpret confidence intervals for population parameters in context. 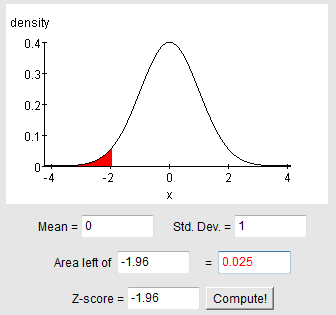 LO 4.31: Find confidence intervals for the population mean using the normal distribution (Z) based confidence interval formula (when required conditions are met) and perform sample size calculations. LO 6.24: Explain the connection between the sampling distribution of a statistic, and its properties as a point estimator. LO 6.25: Explain what a confidence interval represents and determine how changes in sample size and confidence level affect the precision of the confidence interval. As the introduction mentioned, we’ll start our discussion on interval estimation with interval estimation for the population mean μ (mu). We’ll start by showing how a 95% confidence interval is constructed, and later generalize to other levels of confidence. We’ll also discuss practical issues related to interval estimation. Suppose that we are interested in studying the IQ levels of students at Smart University (SU). In particular (since IQ level is a quantitative variable), we are interested in estimating μ (mu), the mean IQ level of all the students at SU. We will assume that from past research on IQ scores in different universities, it is known that the IQ standard deviation in such populations is σ (sigma) = 15. In order to estimate μ (mu), a random sample of 100 SU students was chosen, and their (sample) mean IQ level is calculated (let’s assume, for now, that we have not yet found the sample mean). We will now show the rationale behind constructing a 95% confidence interval for the population mean μ (mu). We learned in the “Sampling Distributions” section of probability that according to the central limit theorem, the sampling distribution of the sample mean x-bar is approximately normal with a mean of μ (mu) and standard deviation of σ/sqrt(n) = sigma/sqrt(n). In our example, then, (where σ (sigma) = 15 and n = 100), the possible values of x-bar, the sample mean IQ level of 100 randomly chosen students, is approximately normal, with mean μ (mu) and standard deviation 15/sqrt(100) = 1.5. Next, we recall and apply the Standard Deviation Rule for the normal distribution, and in particular its second part: There is a 95% chance that the sample mean we will find in our sample falls within 2 * 1.5 = 3 of μ (mu). Obviously, if there is a certain distance between the sample mean and the population mean, we can describe that distance by starting at either value. So, if the sample mean (x-bar) falls within a certain distance of the population mean μ (mu), then the population mean μ (mu) falls within the same distance of the sample mean. So, if we happen to get a sample mean of x-bar = 115, then we are 95% confident that μ (mu) falls within 3 units of 115, or in other words that μ (mu) is covered by the interval (115 – 3, 115 + 3) = (112,118). Note that the first phrasing is about x-bar, which is a random variable; that’s why it makes sense to use probability language. But the second phrasing is about μ (mu), which is a parameter, and thus is a “fixed” value that does not change, and that’s why we should not use probability language to discuss it. In these problems, it is our x-bar that will change when we repeat the process, not μ (mu). This point will become clearer after you do the activities which follow. Let’s generalize the IQ example. Suppose that we are interested in estimating the unknown population mean (μ, mu) based on a random sample of size n. Further, we assume that the population standard deviation (σ, sigma) is known. Note: The assumption that the population standard deviation is known is not usually realistic, however, we make it here to be able to introduce the concepts in the simplest case. Later, we will discuss the changes which need to be made when we do not know the population standard deviation. The values of x-bar follow a normal distribution with (unknown) mean μ (mu) and standard deviation σ/sqrt(n)=sigma/sqrt(n) (known, since both σ, sigma, and n are known). In the standard deviation rule, we stated that approximately 95% of values fall within 2 standard deviations of μ (mu). From now on, we will be a little more precise and use the standard normal table to find the exact value for 95%. 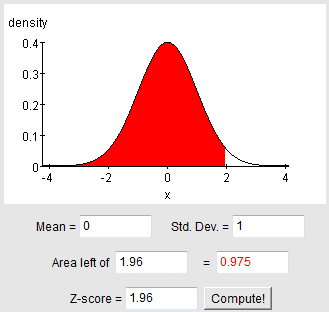 Try using the applet in the post for Learn by Doing – Normal Random Variables to find the cutoff illustrated above. We can also verify the z-score using a calculator or table by finding the z-score with the area of 0.025 to the left (which would give us -1.96) or with the area to the left of 0.975 = 0.95 + 0.025 (which would give us +1.96). Thus, there is a 95% chance that our sample mean x-bar will fall within 1.96*σ/sqrt(n) = 1.96*sigma/sqrt(n) of μ (mu). Which means we are 95% confident that μ (mu) falls within 1.96*σ/sqrt(n) = 1.96*sigma/sqrt(n) of our sample mean x-bar. 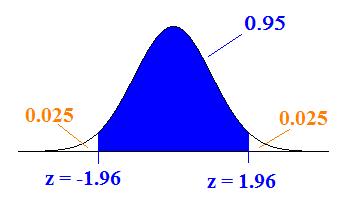 Suppose a random sample of size n is taken from a normal population of values for a quantitative variable whose mean (μ, mu) is unknown, when the standard deviation (σ, sigma) is given. Note that for now we require the population standard deviation (σ, sigma) to be known. Practically, σ (sigma) is rarely known, but for some cases, especially when a lot of research has been done on the quantitative variable whose mean we are estimating (such as IQ, height, weight, scores on standardized tests), it is reasonable to assume that σ (sigma) is known. Eventually, we will see how to proceed when σ (sigma) is unknown, and must be estimated with sample standard deviation (s). An educational researcher was interested in estimating μ (mu), the mean score on the math part of the SAT (SAT-M) of all community college students in his state. To this end, the researcher has chosen a random sample of 650 community college students from his state, and found that their average SAT-M score is 475. Based on a large body of research that was done on the SAT, it is known that the scores roughly follow a normal distribution with the standard deviation σ (sigma) =100. Based on this information, let’s estimate μ (mu) with a 95% confidence interval. We will usually provide information on how to round your final answer. In this case, one decimal place is enough precision for this scenario. You could also round to the nearest whole number without much loss of information here. We are not done yet. An equally important part is to interpret what this means in the context of the problem. We are 95% confident that the mean SAT-M score of all community college students in the researcher’s state is covered by the interval (467.3, 482.7). Note that the confidence interval was obtained by taking 475 ± 7.7. This means that we are 95% confident that by using the sample mean (x-bar = 475) to estimate μ (mu), our error is no more than 7.7 points. We just saw that one interpretation of a 95% confidence interval is that we are 95% confident that the population mean (μ, mu) is contained in the interval. Another useful interpretation in practice is that, given the data, the confidence interval represents the set of plausible values for the population mean μ (mu). As an illustration, let’s return to the example of mean SAT-Math score of community college students. Recall that we had constructed the confidence interval (467.3, 482.7) for the unknown mean SAT-M score for all community college students. Do the results of this study provide evidence that μ (mu), the mean SAT-M score of community college students, is lower than the mean SAT-M score in the general population of college students in that state (which is 480)? The 95% confidence interval for μ (mu) was found to be (467.3, 482.7). Note that 480, the mean SAT-M score in the general population of college students in that state, falls inside the interval, which means that it is one of the plausible values for μ (mu).